Don’t have the time it takes to prepare, season and cook rice for your sushi rolls? No problem. Here’s a great recipe for a delicious sushi roll without sushi rice! It fuses the delicious flavors of salmon and tuna with masago (seasoned capelin roe) and avocado. There’s no sushi rice involved, yet it still results in light, great looking bites, suitable for a party or informal occasion. Fold a sheet of nori in half, pressing firmly along the seam. Glide the blade of your knife along the inside of the seam to separate the two pieces. Switch the toaster to a low heat setting. Carefully put half a sheet of nori over the two slots. Let it heat for only a few seconds. Then flip it over and heat the other side for a few seconds. It’s very important that you don’t heat the nori for too long. Too much heat will weaken the structure of the sheet and cause it to break apart when you roll it. Put the half sheet of nori on the rolling mat with the longer edge facing you. Add the filling, begin with two strips of surimi. Place them one third of the distance from the edge closest to you. Using a teaspoon, add a thin line of masago next to the surimi. You may want to add a little to the edge of the surimi strips too. This will help the avocado adhere when rolling. Add two strips of sushi grade salmon next to the masago. Put two strips of tuna on top of the surimi. Place 2-3 slices of avocado next to the salmon, followed by several thin strips of skinned cucumber. Make sure there are no gaps in between the filling ingredients. That would make the roll appear loose once wrapped. To roll the sheet, simply lift up the edge of the rolling mat closest to you with your fingers. Gradually curl it over the filling. Keep the filling firmly in place with your fingers as you do so. Once the edge of the mat touches the opposite side, gently squeeze the roll along the length to compress it. Lift up the edge of the mat and push it forward, then compress the contents once again. Repeat until the entire roll is sealed. Unravel the rolling mat and let the roll rest for a few minutes. If the seam has not stuck completely, gently turn the roll over so that the weight of the roll is on the seam. This will help it to adhere. 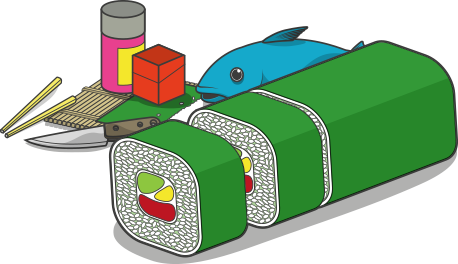 Cut off both ends of the sushi roll and discard or eat. Cut the roll in half and cut each half in thirds to make six bite-size pieces. Serve on a wooden sushi board with a ramekin of wasabi.